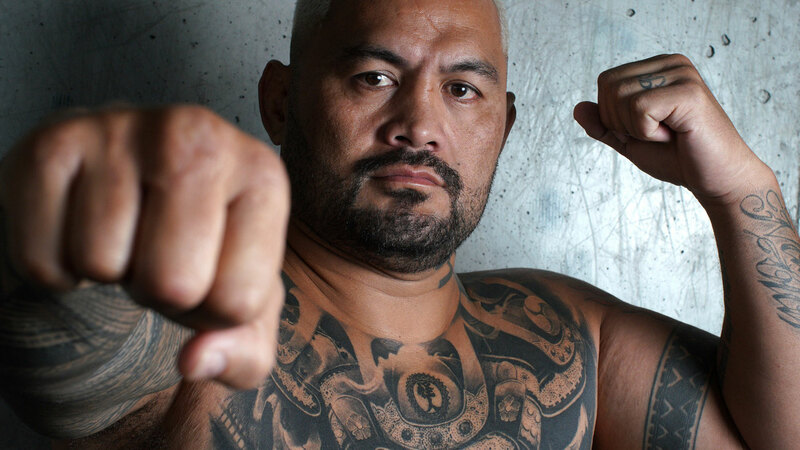 Mark Hunt leaves the UFC convinced that a fighter will die before performance-enhancing drug use is finally stamped out, claiming the problem is as bad as ever. “No, there’s no way it’s improved at all, it’s still the same,” the veteran heavyweight told Wide World Of Sports. “What’s changed about it? There’s nothing changed about the situation, it’s just been passed over. It’s only going to change if the fighters stand up and do something about it. “We don’t need that s*** in any sport, to be honest, and especially in this sport because you’re hurting people; we’re hurting each other. “Sooner or later, someone’s going to cark it (die). Then what happens? 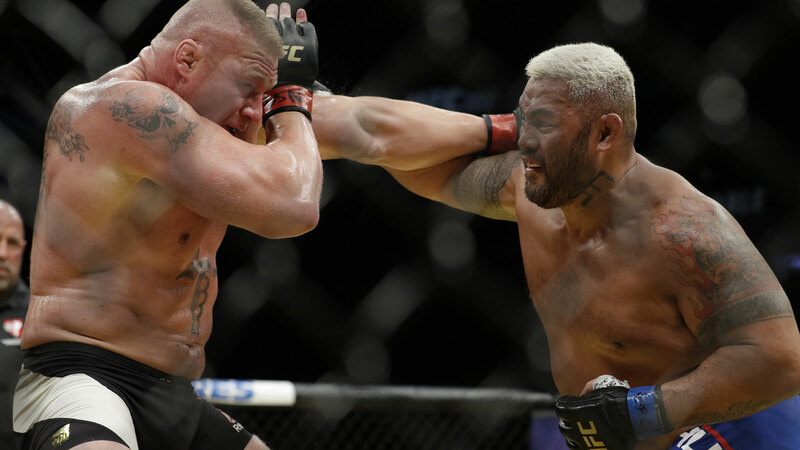 Hunt, 44, has been the UFC’s most outspoken critic of PED use ever since his defeat to former heavyweight champion and WWE superstar Brock Lesnar at UFC 200, in July 2016. His decision loss was overturned to a no-contest after Lesnar tested positive to two banned substances. Hunt was so furious that he launched a lawsuit against Lesnar, UFC president Dana White and the UFC’s parent company Zuffa. The lawsuit is still ongoing, meaning it was always unlikely that Hunt would re-sign with the MMA promotion. His last fight with the UFC comes on Sunday, against American Justin White (age 31, 7-1-0) at UFC Fight Night 142 in Adelaide. “He’s a wrestler. The fight’s going to go: me knocking him out,” Hunt said. While the UFC dramatically escalated its anti-doping efforts by partnering with the United States Anti-Doping Association (USADA) in 2015, Hunt feels that ongoing PED issues have seriously undermined the UFC’s prestige. The UFC has been angling for Lesnar, banned for a year over his UFC 200 bust, to fight Daniel Cormier for the heavyweight title. Jon Jones, twice sanctioned by USADA, will fight to regain the light-heavyweight title at the end of this year at UFC 232. And former middleweight champion Anderson Silva, also busted twice by USADA, claims that he’s been promised a shot at the belt should he beat rising star Israel Adesanya at UFC 234 in February. And his relationship with White? While Hunt is still simmering about PED problems, that torch is left for someone else to pick up and run with now that his time is up in the UFC. “It is what it is. I’m done with it, I’m over with it. I’ve made peace with it,” he said. “I’ve had a lot of fun, I’ve enjoyed the journey at different stages. Hopefully things can change with the PED problem. Hunt’s rise to the biggest stage in MMA has been extraordinary. He had two jail terms under his belt and was fast approaching a third when he was spotted outside an Auckland nightclub, knocking three men senseless. Security guard and kickboxing trainer Sam Marsters saw talent that deserved a better outlet than street brawls and asked him to fight in an event that week at the same nightclub. He won. From a horrific upbringing, in which he dealt with extreme anger issues thanks to his late father’s sexual abuse of his sister, plus the savage beatings he endured, Hunt became a hard-hitting sensation in global combat sports. After relocating himself to Sydney, in 2001 he became the first non-European to win a K-1 kickboxing title. Later came his entry to MMA, with PRIDE in 2004. After losing his pro debut to Hidehiko Yoshida, via armbar in Round 1, he went on a five-fight winning streak that included victories over Wanderlei Silva and Mirko Cro Cop. But then things went horribly wrong as he hit a five-fight skid, featuring losses to Josh Barnett, Fedor Emilianenko, Alistair Overeem, Melvin Manhoef and Gegard Mousasi. When the UFC bought PRIDE in 2007, Hunt looked surplus to requirements and White wanted to buy out his contract for $US300,000. That was despite White, who admitted that he wanted Hunt to “go away”, offering him just $US6,000 per fight to stay. It looked an ill-fated decision when he lost his first fight to Sean McCorkle at UFC 119, September 2010. That was six losses straight and more than four years without a win. Then came UFC 127 in Sydney, February 2011, where he was hidden away in an early prelim bout against Chris Tuchscherer. A savage uppercut that sent Tuchscherer into space earned Hunt Knockout of the Night and a $US75,000 bonus. As became his trademark, the 'Super Samoan' casually walked off after dropping his opponent. He was back. From there, by White’s reckoning, Hunt became “one of the greatest stories in sports”. A string of high-action fights saw him earn a late call-up to fight Fabricio Werdum for the interim UFC heavyweight championship in 2014, though he lost by Round 2 TKO at UFC 180 in Mexico City after less than four weeks’ preparation. 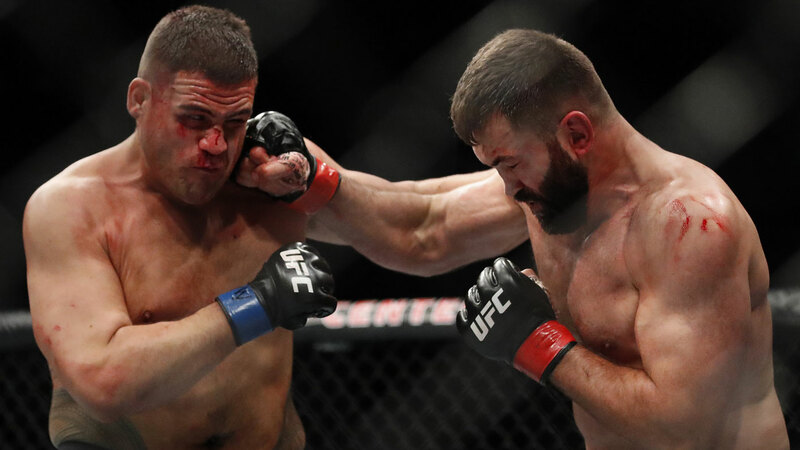 He then took a savage beating from Stipe Miocic, the future champion, before knocking out Antonio Silva in the first round in a rematch of their epic Brisbane fight (a bloody draw). 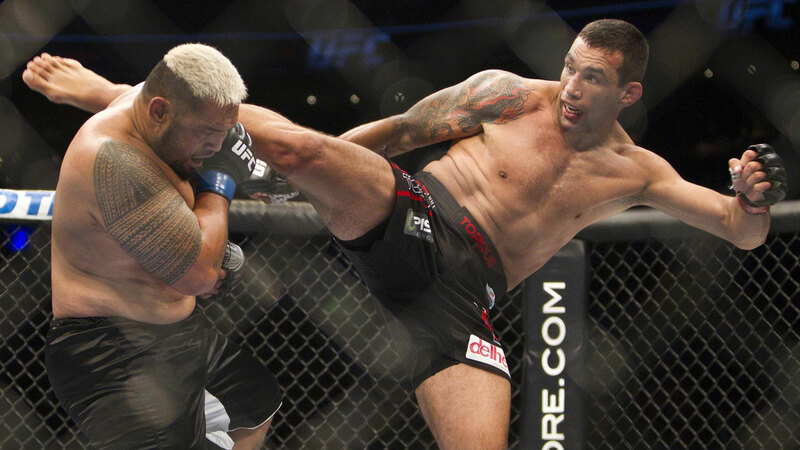 He also dispatched former champion Frank Mir with a trademark walk-off KO in Round 1. Whether it was advancing age or the rage of injustice, Hunt wasn’t the same after the Lesnar debacle. He has gone 1-3 since then, though he did beat recent title contender Derrick Lewis by TKO last year. Hunt never got the UFC championship that he felt would have been his if not for drug cheats, and feels those dishonest fighters have cost him millions in earnings. Nearly half of the fights he has taken in pro MMA have been against PED-tainted opponents. That includes the man who denied him a belt, Werdum, who tested positive in April this year and received a two-year ban from USADA. Three fighters in a row - Silva, Mir and Lesnar - tested positive after fighting Hunt. Lesnar received a then-record UFC salary of $US2.5 million for fighting Hunt and lost only $US250,000 (10 per cent) when sanctioned by the Nevada State Athletic Commission for PED use. So in such a turbulent career, who was the best fighter Hunt saw among the UFC's heavyweights? Yet he has high hopes for the man who will headline the Adelaide card: Indigenous Australian heavyweight Tai Tuivasa, Hunt’s frequent sparring partner and fellow Western Sydney resident. Tuivasa, 25, will take on former champion Junior dos Santos (Hunt lost to the Brazilian by KO in 2013, copping a spinning heel kick to the forehead). “Tai’s a good dude,” Hunt said of Tuivasa, nicknamed ‘Bam Bam’. “Hopefully he makes smart decisions, wins the right fights and gets a run without cheaters in there. While Hunt (13-13-1, 1NC) is finished in the UFC, he wants to keep fighting despite his age. He is yet to speak to any rival promotions but intends to retire at the end of next year, after plenty more fights. And from that lowly pay cheque of $US6,000 in his first UFC bout eight years ago, Hunt’s last reported fee for a fight was $US750,000 (just over $1 million). “I’m done in the UFC of course, but I’m not done fighting,” Hunt said. “I’ll probably compete five more times next year, then retire. But plans never work out anyway, so who knows? “The body’s good. I don’t train as crazy as I used to. The body’s in good nick. The walk-off KO king walks off into the sunset. It’s been a thrilling and brutal ride watching him in the Octagon.